The Cantina for the Con is known for it’s amazing tacos and a raffle that has had over $15,000 in prizes to give away to ticket holders! Participate in this event by donating raffle prizes, purchasing raffle tickets to win, or both. 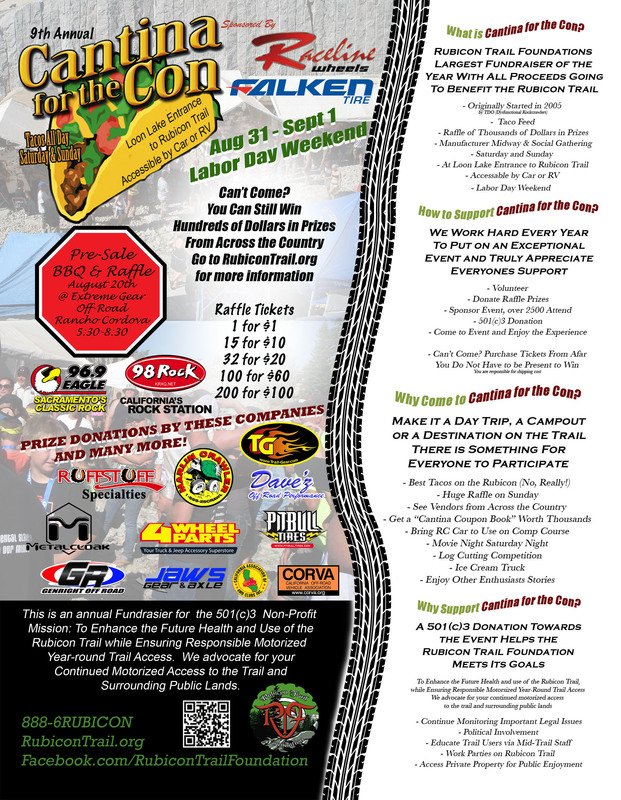 Along with items from all the above mentioned sponsors, there will also be raffle prizes and displays from Off-Road Jerky, Napier Outdoors, Jeepers Jamboree, Snevey’s Offroad, Inchworm Rock Walkin’ Gear, Varozza 4×4 Outfitters, J&W Jeep, Advance Adapters, Auburn Powersports, Factory UTV, Keith’s Alignment, WFO, Viair, Sierra Smokehouse BBQ, Crown Automotive Sales, Hellfire Fabworks, IH Only North, Reid Racing, All-Pro Offroad, John & Barb Arenz, Race Team Store, NorCal Rock Racing, Sidetracked Offroad, Casper’s Muffler, Talking Threads, ARB USA, Ben’s Paint Supply, Busted Knuckle Films, ADCO Drivelines & Custom Exhaust Systems, Almar Mfg, Billetfairlead.com, Axial, Eagle Radiator & Muffler and more companies always finds their way to the stage by 3pm on Sunday when the raffle starts. You can join us as a day trip in your car, a campout in your RV or a destination on the trail in your 4×4. Come to the Loon Lake entrance to the Rubicon Trail on Saturday August 31st or Sunday September 1st. Enjoy the most talked about Tacos on the Rubicon Trail and the Manufacturers Midway where companies come from all over to enjoy a weekend in the mountains. Get a Cantina Coupon Book worth Thousands of dollars in savings. Bring your RC car to use on a competition course, bring your muscles and compete in the log cutting competition, bring your offroad vehicles to explore the trail. Enjoy the first ever Movie Night on Saturday night and top off your day with Ice Cream. The raffle is on Sunday, and you do not need to be present to win.